So I’ve been asked to give a good description of the overflow and how it works. 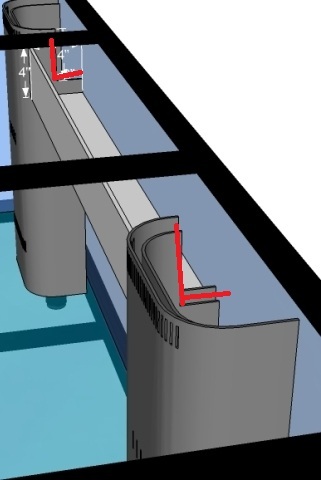 Before I begin, I want to credit teslareef on rc for the CAD drawings. How it works, it’s a bean animal design. The plumbing from left to right is Siphon, emergency, return, wet. The siphon will be solid with water and have a valve to control flow through it. 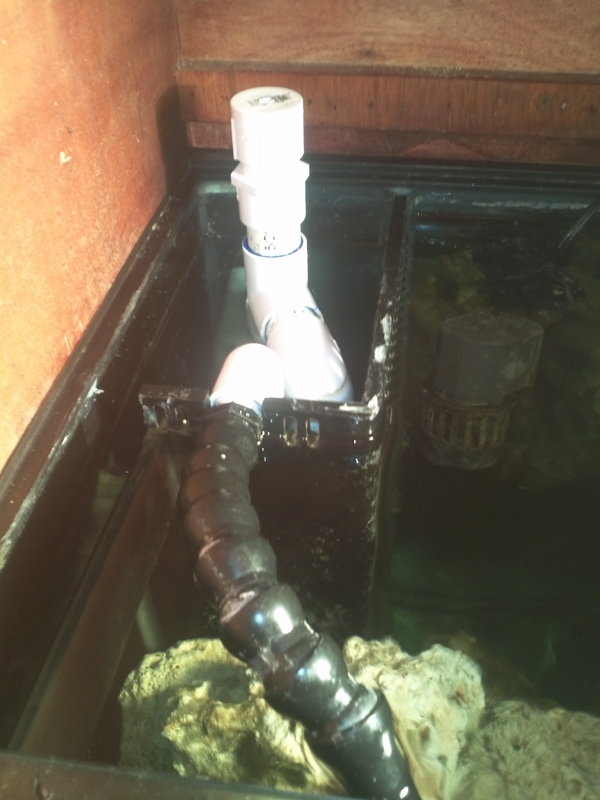 Since a siphon is the best way to move water and is absolutely silent, that’s takes the bulk of the water flow. Pumps fluctuate, so you couldn’t only have a siphon, because of that you have a wet stand pipe. The wet stand pipe takes any fluctuations that are in the flow. The last pipe is emergency, which will take flow in the event the wet or siphon become clogged. If the siphon or wet (when I install the airline piece in the cap) reach a certain level, they will turn into siphons a “flush” all the water into your sump. How do I make dual overflows work as one was my new problem. 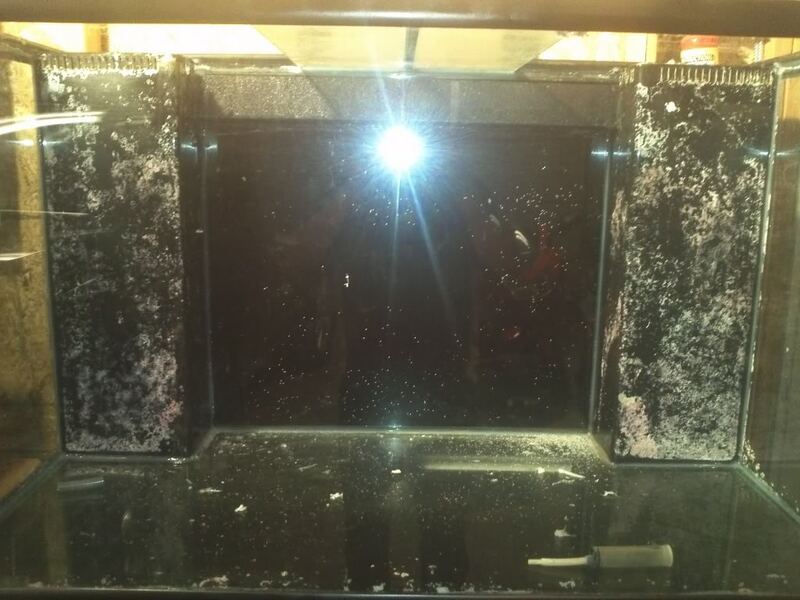 A few solutions are to remove both overflows, put in a false wall all the way across making one big overflow (also taking away a lot of display area), I could have run a pipe from overflow to overflow in the display(which wouldn’t have been bad if I kept it under the sand level), and lastly what I did, was to connect the two with a weir. I added the weir because it would serve two purposes, one, connecting the overflows and two, giving me coast to coast(C2C) skimming. C2C skimming also helps to reduce noise and air entering into the overflow. And here are the notches in my overflow. Notice the hole in the cap, eventually this will be tapped and have an airline coming out of it. I intend to put the end of the airline *lower* than the emergency so I can turn the wet into a siphon before the emergency even takes effect. 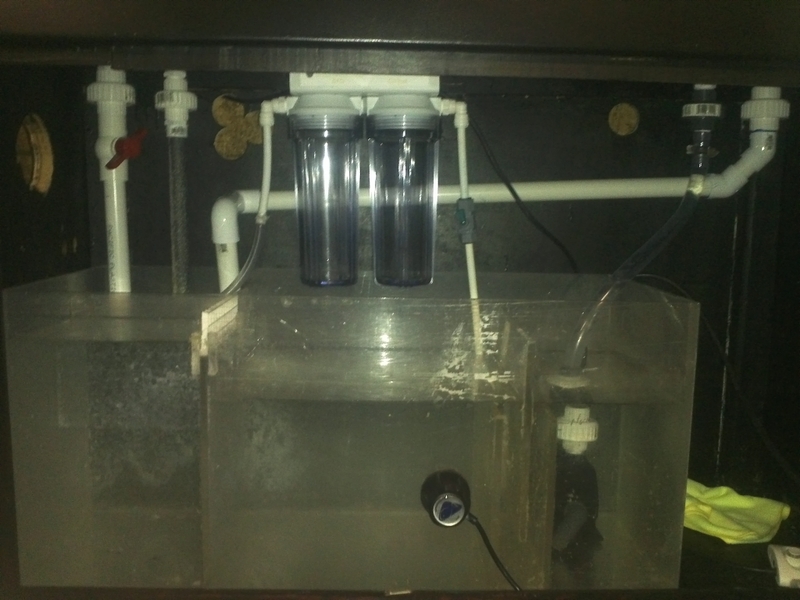 Here is the plumbing laid out in the tank. It overflows both the factory weirs and the new weir. Once both overflows are filled (if you were just setting up a tank it would go in both equally) the path of least resistance will be the overflow on the right because the inlet of the wet is too high. So all the water is going to go to the siphon drain. Now remember we set the siphon to take most but not all of the flow. 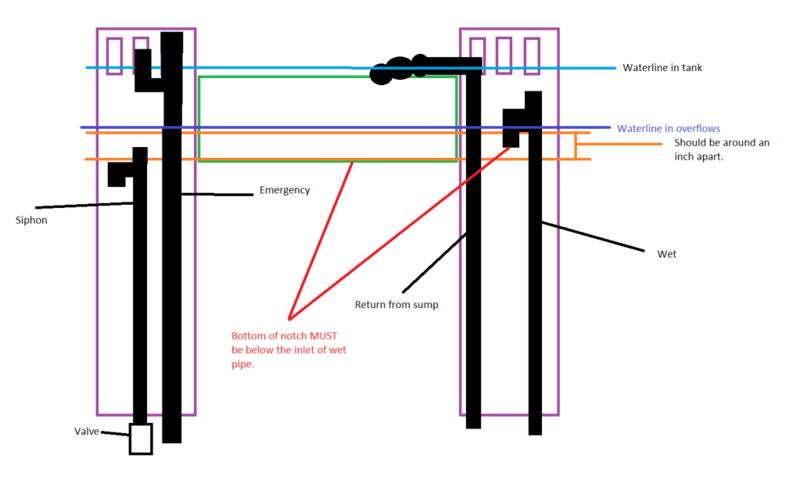 Because it’s not taking all the flow the water level will rise to the inlet of the wet drain and eventually start going down that(like a traditional durso standpipe) the amount of water that goes down the wet is little, so there isn’t a lot if any noise. In the event that one clogged, the water would continue to rise, and eventually go into the emergency and flow down that. Once you clear the clog, it will go back to normal. After everything is said and done, the two things I would change are the width of the new weir(front to back) and the valve on the siphon. I would, if I didn’t have a canopy, make the weir a 1.5” so water could flow easier to the left(with the canopy open there is a little(like less than my mp10/40) noise. With the canopy shut I don’t hear it. Also, and I plan to do this, is to put a gate valve, not ball valve, on my siphon. It will allow me to have a more fine control of flow. 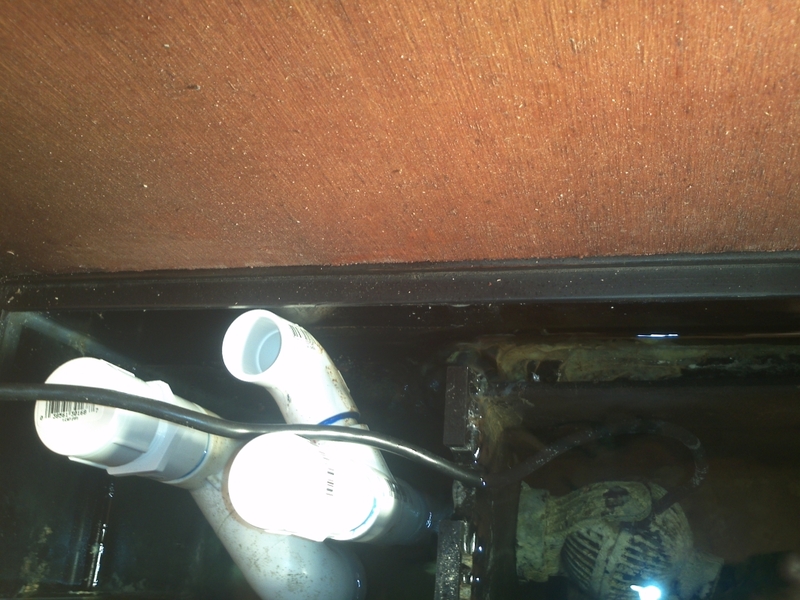 It is very quiet through entering in my sump, but, I want as little bubbles made as possible (and I am just nit picking here) Also while I am on the note of entering the sump, the pipes need to be about 3/4” deep into the water. No lower or higher (you do have about 1/4” of tolerance either way). If you go too deep the water can’t push the air bubble out, and if its above the water, it won’t create a siphon and make a lot of noise.